What Is The Best Horse Feed For Weight Gain On The Market? There are a great many horse owners who would give their back teeth to have a horse who didn’t put on weight too easily, but there are an equal number who wish their four legged friend would put on a bit of podge. Natives tend to run to fat far easier than the hot blooded or Thoroughbred types, and if you have one of these slimmer horses then you may wish to consider adding a little something to the feed to bulk them out a little. Older horses, like older humans, can often struggle to keep fat on them. 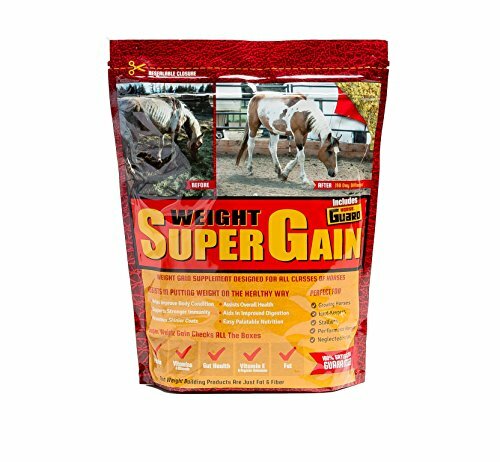 This is a calorie rich formula designed to help your horse gain and maintain the ideal weight. Vegetable fat offers concentrated and easily digested calories that can also improve your horse’s overall energy levels. Contains fibre for the gut – Fibre is an essential part of your horse’s diet, as it keeps the digestive system running smoothly. Contains protein and amino acids – This is a great thing for the horse who is still in active work, as it can help to build muscle tone as well as add weight. Convenient packaging for travelling – These packs come in pre-measured quantities in sealed packing, ideal for taking out an about with you. They won’t be damaged by oxygen or sunlight as they are completely protected. Added minerals for skeletal and joint support – Containing calcium and phosphorus too, this supplement can help your horse’s bones as well as their metabolism. Does not ship outside of the United States – This product cannot be shipped outside of the US, so you may have to look for other sellers who will send it to you if you are not US based. A great supplement for putting on, and maintaining weight. It comes in an apple flavour which horses love, so you will have no worries about getting your old timer to eat it. This product is also gentle on the digestion, so if your horse has stomach issues then you can use it with no worries at all. A great supplement that can add weight, without relying on sugars and starches to get the desired results. Probiotics and prebiotics are added to the formula to help with any potential stomach issues too. Won’t make your horse “hot” – Using soy beans for energy (instead of corn or oats) won’t give your horses enough bounce to make them scary, it will just add the weight and keep them healthy. Results can be seen quickly – Unlike some supplements, you won’t have to wait until half the bag is gone before you see results. This product works quickly and is highly effective. Very easy to use – The product comes as a powder that you mix into other feed, so even if you have a fussy horse who doesn’t like to eat new things you should be able to use this with no problems. Contains added minerals – Bacterial and yeast additives, along with other key minerals such as Selenium and Vitamin E, give your horse the best boost for their gut as well as for their overall health. Results vary between horses – Some respond very well and very quickly, others show very little response to the supplement. A good supplement for weight gain, with added bits and bobs to improve the whole of the horse’s health. 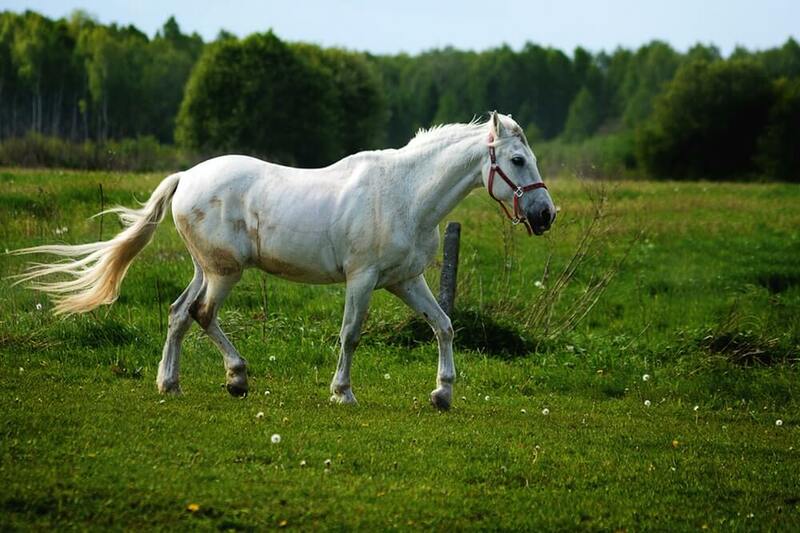 This product can also be sued for horses who lose weight due to stress, through travelling, foaling, weaning or other issues that are not related to old age. This supplement contains high fat and calorie levels for good, quick weight gain. It is especially formulated for the older horse, and contains a variety of vitamins and minerals to benefit the health of the horse, not just for adding weight. Contains flaxseed – This unassuming addition is packed with omega acids, which ca benefit the entire body. The coat will look better, and any skin issues should clear up using this product. Contains Biotin for healthy hooves – Good feet are essential for an animal that has four of them! The Biotin in this product will help your four legged friend maintain his toes as well as he possibly can. 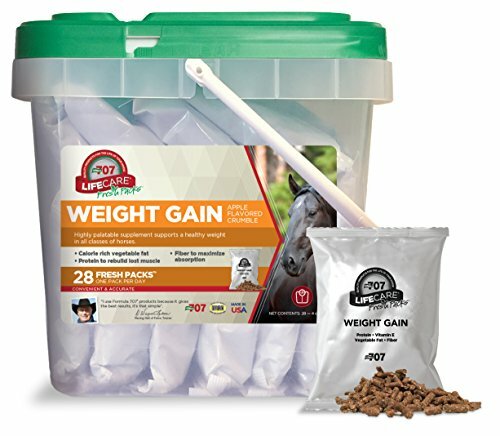 Easy to hide in food – For the fussy horse who doesn’t like additives in his bucket, this supplement is ideal – just one scoop in a bucket will provide all his weight gaining needs, and he won’t even notice that it’s in there. Good value for money – A little of this product goes a long way. The amount in this bag will easily last a month, and will show fantastic results. Some horses don’t like the taste – There seem to be very few issues with this product! The one small problem that some people report is that their horse doesn’t like the taste, but you could easily get around this by hiding it in a strong-tasting feed. A really good product that delivers results quickly, this one does what it says on the tin. It is inexpensive and will put weight on your old, skinny horse, as well as make the coat shine and strengthen the hooves. If you are looking for what is the best horse feed for weight gain, then look no further. Winters can be hard on older horses, and keeping nutrients in the body is essential. Some breeds of horses also struggle to keep a good topline, so feeding a supplement can really help. If you have a horse who travels and needs a supplement that can be kept fresh on the road, opt for the Formula 707 Daily Fresh Packs Equine Supplements. For the horse with a delicate stomach, choose Horse Guard Super Weight Gain Equine Vitamin, Mineral, Probiotic and Weight Gain Supplement, for weight gain with added gut support. 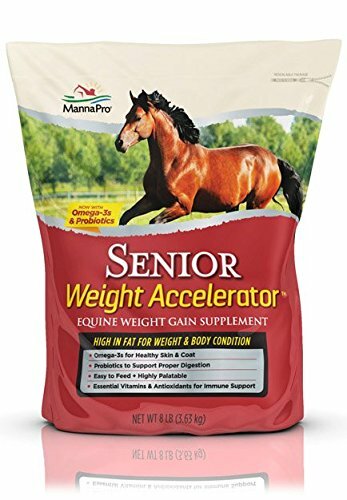 If you have an old horse who is consistently losing weight, try the Manna Pro Senior Weight Accelerator. I wonder how many calories a horse would burn in a typical day! Getting all of that exercise and basically being 100% lean, you would think keeping some of the fat ON would be a problem.